Moose Knuckle Classic Core jackets and parkas are created using a blend of fabric consisting of 74% Cotton and 26% Nylon, this blend ensures durability, strength and warmth, this is only one of the many major components that bring quality and the luxurious look into our parka designs. Each garment is coated on the backside of the shell fabric to create a protective inner shield from wind and water. This repellent system has been tested to perform well in the harsh cold winter temperatures, helping our clients stay warm in -40 degree cold extremes. Our zippers are a heavy duty industrial YKK zipper. YKK makes the world’s toughest and longest lasting zippers. The initial stiffness of the zipper will loosen with wear, and the double adjustable zipper makes it easy to comfortably adjust your jacket or parka to sit warmly in any setting. Our detachable hoods are created not only for you to wear your parka in milder temperatures, but are also useful when cleaning your coat body, without causing damage to your fur hood or pom poms. We use Arctic Blue Fox and Silver Fox furs. Each fur is produced with the high quality selected from Scandinavian and Canadian furriers that are ethically certified. The natural fur colours make for each jacket or parka to be unique with colours running from white, white & brown tints, silver, and our new black fur. Fox fur is soft, sleek and naturally stronger, giving an advantage of a fluffy and fuller look that will stay beautiful year after year, even though the roughest treatment! Our thermal insulator is Grey Duck Down with a Loft of 650 cubic inches per ounce. This insulator is used in all our jackets and parkas for protection and padding in the harshest conditions. Down product is one of the oldest traditional clothing insulators. Down filaments come from the fluffy coating from ducks and goose, that overlap to create small air pockets that trap warmth and body heat. These filaments are breathable and keep away moisture. The loft size is measured by a standardized fill power measurement system. The fill power is measured by the number of cubic inches per given ounce. An ounce of down is placed in a graduated cylinder with a small weight placed on top of it; the volume below the weight indicates the fill power. The larger the number, the more mature the bird, which equals a higher loft in down. Our loft blend is 800 per cubic oz, guaranteed to keep you warm. The details on our jackets are subtle, each crafted to personalize the uniqueness; we believe each jacket and parka is as diverse as the people who wear them. Apart from the different colours of our furs, our MK emblem located on the left side of the jacket, has its own uniqueness. Each emblem is made from steel metal with colours ranging from; gun metal, antique nickel, royal brass, matte black, matte silver and 14k gold plated. Our inside yolk logo showcasing the hockey fight between Canada and our neighbour to the South reflects our brand’s humorous spirit and the love Canadians have for our national sport. WARNING: BEWARE OF FRAUDULENT MOOSE KNUCKLES WEB STORES! Please be aware that our Moose Knuckles coats and jackets are often copied by counterfeiters. After analysis of the contents of those copied products, it is easy to see that fillers are used in place of down, full of bacteria and other harmful substances. We guarantee our coats to protect against the harsh Canadian winters; no fur and no down means higher chances of frostbite or freezing. For more product information visit our Product Information section. Please also note that inside each Moose Knuckles coat and jacket there is a hologram tag that acts as an authentic product identifier. If you do not see this hologram then there is a chance your coat is a fake. Any Moose Knuckles products coming from an un-authorized retailer are not covered by our warranty. To purchase an authentic Moose Knuckles product, visit an authorized retailer. To locate an authorized retailer, please visit our Store Locator. For our products featuring fur, we use an assortment of furs, lamb, rabbit, but mainly Blue and Silver Fox (in 3 different colour varieties: Natural Blue Fox, Dyed Blue Fox and Natural Red Fox) as well as Shadow Fox Fur. We only use Saga Certified furs. Please note that when ordering one of our products that feature fur, we cannot guarantee the colour of the fur because of natural variations. Periodic cleaning of down jackets is essential to maintaining maximum loft and ensuring the long life of the product. We recommend that you have your jacket professionally dry cleaned by a service that specializes in down insulated products. Please make sure to refer to the product care label on your garment for specific wash care instructions. Fur should not be dry cleaned! To maintain fur's appearance, do not rub away or dab any water that gets on it. The fur will end up matting. Just shake off the moisture that has collected, and then hang it in a cool, dry place. You can brush the fur using a proper fur brush. Be sure to brush following the direction of the hair, and to use short and even strokes as you work a small section at a time. Fur brushes have wider spaced teeth and soft edges, which prevent the brush from damaging the skin of the fur. If you do not have a proper fur brush, you can run your fingers through the fur to help clear-out any dirt or debris. Never brush your fur with a "normal" brush. This will damage the fur as the teeth on a normal brush are too fine. Avoid making long strokes the length of the coat. This can cause the coat to stretch. We recommend that you store your jacket in a garment bag to help the jacket maintaining its loft throughout its lifespan. Make sure you store your jacket in the cleanest condition possible as sweat and unwanted chemicals will degrade the fabrics over time. If you have any question regarding care, cleaning or maintenance of any of your Moose Knuckles products, just contact us, we’ll be more than happy to help you! Since 1921 our family has been protecting Canadians from the cold—a relentless quest that founded Moose Knuckles Canada in 2007. From day one we have made it a priority to invest in Canada. From our tradition-steeped factories in Winnipeg, to our expert furriers in Toronto, to our passionate design team in Montreal, everything we do here is Canadian to the core. We cultivate homegrown talent and skill, and live to innovate, challenge and lead the industry from our home turf. Our core parkas, bombers and other jackets are made in Canada with Canadian and imported components. 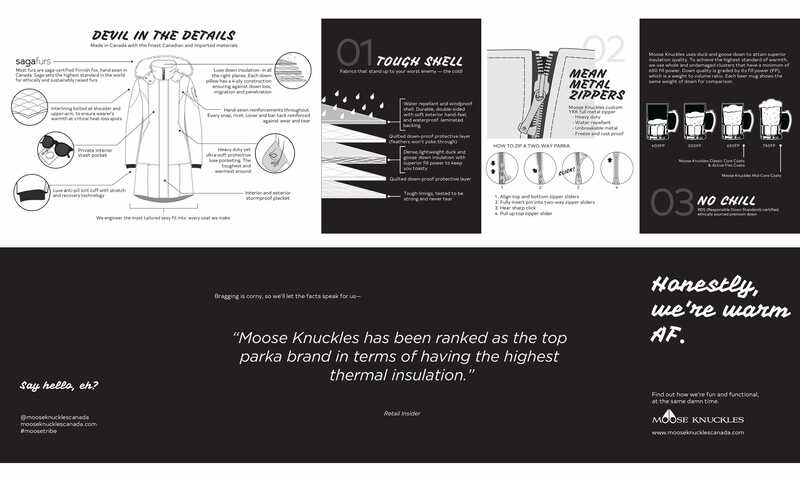 Here's what we do in Canada: Moose Knuckles currently operates from three factories, and employs 200+ Canadians—including 90 skilled technicians—in the design, quality maintenance and production of our core coat collection. We proudly support local manufacturing. As a result, we inject millions of dollars annually in the Canadian economy, while preserving a tradition of Canadian craftsmanship. The artisanal process of producing an average Moose Knuckles coat requires 74 operations and 90 skilled craftspeople. Each process is done by hand and requires the expertise of skilled pattern makers, machine operators, sewers and many other, all of whom, work tirelessly to bring you the finest coats that can be built. Our design team discerningly sources the very best raw materials and other components globally for our time-honoured premium garments, tailored for contemporary living. We build Canadian know-how, grit and heritage into every fiber, stitch and zipper. Our impeccable tailoring, luxury materials, hardware, attention to detail and our wild attitude have earned us praise from the very best luxury retailers, in 25 countries worldwide. We are a family, a tribe, a pack and we wear it on our sleeves, whether it’s a wild night or the wild country, we’ve got you covered…Welcome To Canada… Welcome to Moose Knuckles.